Have you ever wished that gardening could be easier, less strenuous, and, above all, more fun? Well, it can be! First of all, you need to learn to enjoy yourself in the garden; after that, everything else will become less burdensome. In the meantime, here are some ways for you to cultivate a low-maintenance garden. Drip Irrigation – First of all, if you don’t enjoy watering the garden, why not invest in drip irrigation? Drip irrigation is a great way to water the garden without having to worry about the patio, walkway, driveway, or lawn getting soaked. It saves water, too, because water can be applied directly to the soil, so that less is subject to evaporate. If you do use drip irrigation, make sure you check the drip heads regularly to make sure none of them are clogged. A clogged drip head could lead to the dehydration of the plant it was suppose to be watering. Planter's Beds – Tired of coming in from the garden with a sore back? If bending over is making you hate your garden, then why not plant on raised planter’s boxes? Bringing the plants up to your level will make it easier for you to water them, prune them, and collect any fruits and veggies. Perhaps you’ll enjoy gardening when you’re no longer in pain. Mulch – If you’re looking for a solution that will allow you to take more time off between weeding and watering, mulch is your answer. 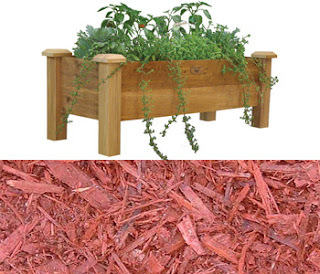 Mulch is great for locking in moisture so your plants won’t be thirsty as frequently, and it also helps stunt the growth of weeds and other pesky plant invaders. Plus, mulch makes a garden look polished and well kept, so you really can’t go wrong.